Yves here. 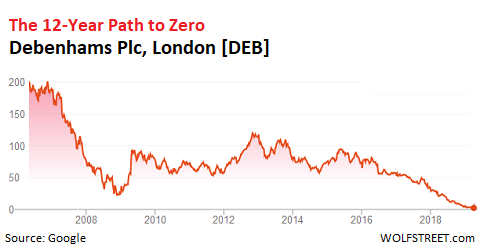 Wolf Richter, and now his colleague Don Quijones with the implosion of Debenhams, have been chronicling the wipeout in bricks and mortar retailers and in particular, the significant role private equity has played in many of these demises. Some of them, like the bankruptcy of Toys ‘R” Us, resulted from good old fashioned overleveraging, which led to under-investment, especially in e-commerce. But another big factor, chronicled at length in the landmark book Private Equity at Work by Eileen Appelbaum and Rosemary Batt, is asset stripping. Many retailers own their own stores so as to lower their operating costs and enable them to ride out business cycles. Private equity firms would often sell the real estate, then lease it back to the retailer, often at a high rental so as to provide attractive yields on the properties. The spun-out stores would fetch a nice price early in the deal’s life, goosing the apparent returns….and providing an ample cushion if (and more often than not, when) the retailer foundered under the high lease payments. The report concludes that retailers should be run as retailers, by retailers, not as cash cows by financiers. Unfortunately, for many fallen firms, their other stakeholders, and employees, it’s a little late in the day for such advice. Rents going up where there is an oversupply of space? The over supply of space really isn’t that huge anymore so things have naturally tightened. Come to my neck of the woods and you’ll see plenty of space. You must live in a better forest. The UK creature, the 5yr upwards only rent review, is also to blame. Only by putting businesses through the insolvency wall have some retailers managed to shed or restructure their lease obligations for the brutal new world of multichannel competition, where the gulf between destination sites and the rest grows ever wider but the rent differential does not…. Mike Ashley does this all the time, see House of Fraser etc. I have seen this from my conversations with a local small business owner. Commercial rents are now disconnected from local business conditions. This looks to be a direct result of outside ownership, or, almost as bad, property management of commercial space. Short term thinking coupled with the “shareholder equity” business philosophy has resulted in a phenomenon similar to what has happened in residential property. A space is now managed as a stand alone income generating entity, not a place to live or conduct business. Thus, if you “own” a group of properties, running the show strictly for a base, preset profit margin, and some of the spaces lose tenants, you respond by raising the rents of the remaining tenants to make up the difference. If the resulting downward spiral is of longer than a single quarter’s duration, you do not even recognize it in order to take it into consideration. The second item to note about commercial rental vacancy rates is the constantly shifting physical locations of “Prime Locations.” The ‘trendy’ neighborhoods keep moving as areas spring up, all shiny and new and then slowly but certainly sink into first genteel decay and later into outright poverty. The stores that cater to the money crowd, and there is a lot of that, must move along with the money, to remain near to their primary customers. Hence, new strip malls moving ever further out from the urban centre. In those places where Urban Renaissance is successful, the rents of the older, refurbishable store space still go up, often to pay for not only the rebuilding costs but also heightened return on investment expectations. All this underscores one of the main failings of the Technocratic World View. Technocracy supposes a world run on the lines of rationality. Such is not the case. Perhaps this may come true when the Robot Lords take over. Considering that the programs that the Robot Lords utilize to function were originally written by ‘Fallible Meat Units,’ the eventual outcomes fell far short of rational expectations. It’s control fraud. The same playbook that is being used to hollow out Sears. No one cares. All journo/pundit/Twitter outrage is obssessed w/Trump. Nothing else matters–especially as control fraud can’t be explained on a bumper sticker. This post doesn’t even try and is factually irrelevant. ending PE vulturism is a political/tax code question. There is no organized interest advocating to upending the pro-PE status quo in DC or Westminister—even among Berniecrats. There are lots of lobbyists for the status quo/pushing the tax code into their favor. If no lobbyist in DC/Westminster is advocating for a position, it’s essentially the same as if no one cares. That is how lobbyists work. We are all tribals in the end, fighting our share of the rewards. For labor it can be tough, even when you think you have victory, the ownership that capital has, can create problems to undermine that. As a resident of London in the early 2010’s, I never really understood Debbenham’s place in the market. If pressed, I could pretty easily characterize the market niche or identify of the other Oxford Street / Central London department stores (M&S, John Lewis, Selfridge’s, Liberty, Fortnum & Mason, etc), but Debbenham’s always seemed a bit superfluous and/or adrift. Am not sure if that was due to lack of vision and/or marketing investment by PE, or whether the store’s identity had simply run its course (would be curious to hear from those with longer-term perspective on the store’s market identity)–but not surprised to see it finally seems to have gone under–and am never surprised that PE investment was at the *very* least highly correlated, if not (more likely) highly causal of the event. May I very gently suggest you were leading a somewhat sheltered life in the UK by that list of retailers. M&S is as middle-class (UK usage, not grade-inflated US synonym for working class) as they come and the rest step on up from there: John Lewis, haute bourgeois Miele-appliance and iThing warehouse (and owner of the UK’s smartest supermarket, Waitrose); Selfridge’s, the non-tourist version of Harrods; Liberty, taste-by-(large)-numbers department store (departments include Persian carpets, William Morris furniture and Cartier concessions); Fortnum & Mason, aristo’s’ local grocer in Mayfair. There’s probably a lot of people in Brexitland who could tell you the point of Debenhams, though. Personally, I couldn’t (vendor of unflattering natural-mix clothing for Martin Parr photoshoots? Like Next but dowdier?) but I fall smack in the M&S to Fortnums bracket. It is telling that in my home town, rapidly gentrifying with Down-from-London types, Debenhams sold its building so John Lewis could move in…. Ps: In thriving towns, Debenhams has appeared a dead man walking for twenty years, like BHS and Woolworths. RIP store ive never been to. Samuel Stein in his book “Capital City” calls it predatory equity. Just another company that was already weak entering the naughts, kept alive by the mortgage bubble only to find the rest of its customer base was gone after the crash. Private Equity are the vultures of doom. The Crows in the distance. Why are the tactics of private equity even legal? It is akin to selling off body parts and finally killing the person for that last precious profit generating, but vital organ. Obscenity thy name is American capitalism. Why is Amazon legal? We have crapified everything down to the very bone, and now the bones are being hollowed out. I still shop at my local, independent bookstore, patronize non-chain local restaurants, and shop at my local grocery store — because I want to, but also because I want them to BE here! They are our neighborhood, our community. It will be so sad for the next generation if they don’t survive their current owners. In the Chicago suburbs massive increases in property taxes upwards of 300% on small property owner commercial buildings have forced small building owners to raise rents. It is, in areas, more profitable for a landlord to leave a store front vacant (because of the corresponding fall in property taxes) than it is to let the rents fall to fill the space. Meanwhile large building owners with retail space march the team of lawyers into the assessor’s office and get fabulous tax breaks. Whatever PE or vulture capitalism started as, whatever darwinian claims could be made for ‘culling the weakest to increases the herd’s robustness’, it seems to me that PE has now morphed into a deadly virus, destroying all in its path, with no benefit to the larger community. imo. So PE is just a bust out in polite company? Debenham’s is just a shop. If PE can take over a shop and make money by ruining it then that is capitalism and fair enough. If there really is a place in the market for a Debenham’s then another will grow there, if there isn’t then we have to call it a day. Shops are just rooms full of other people’s stuff and what little value they create is easy to copy.